All Goods / Vehicles & Parts. Remain the property of Border Reivers (classic cars ) Ltd until paid for in full. All unauthorised storage will be charge at £20.00 per day. All vehicle must be paid for in full before collection/delivery. 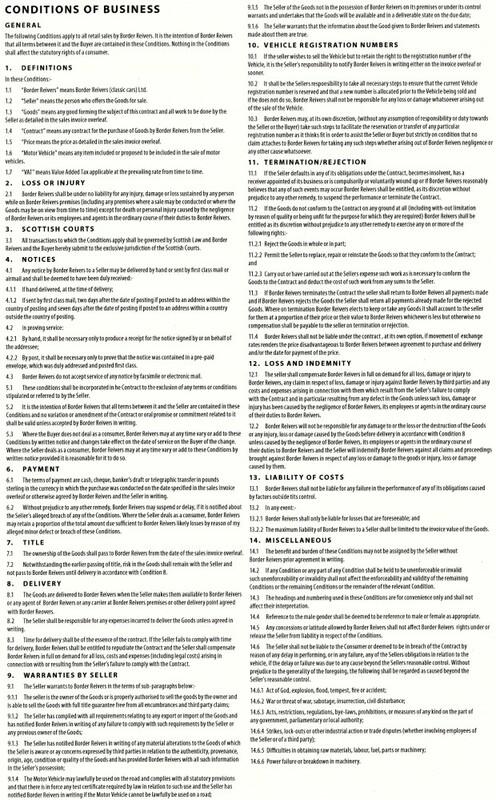 Warranty Statement for Border Reivers Classic Cars. This may well be your first purchase of this type of car, perhaps you are already an avid enthusiast. Whatever the case, we are sure that you will understand that the car which is new to you has already been on the road for many years & has in most cases seen considerable use. These cars are very different to modern cars. 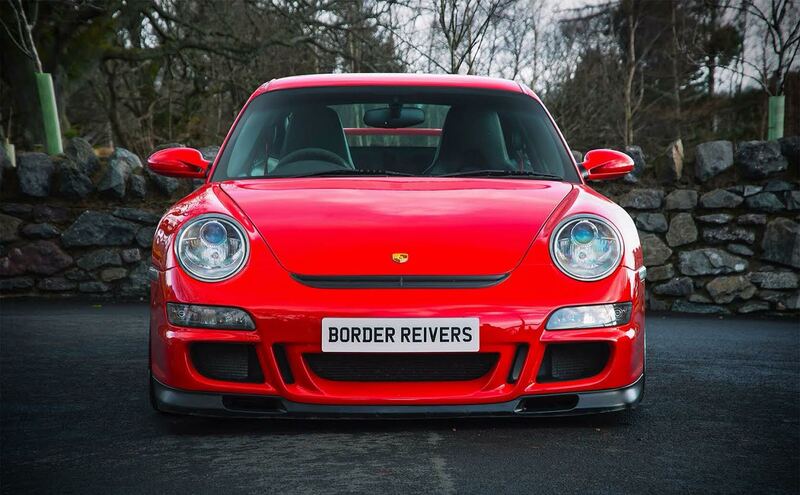 Border Reivers range of cars span over six decades of motoring, so you can imagine the difficulty in deciding on an appropriate warranty policy for this range of car types, ages & condition. Our policy on pre-delivery preparation has been focused on safety, and for that reason, even though almost all cars come to us with a current M.O.T. We prepare them to a standard we believe to be acceptable and submit them for an M.O.T, by an independent testing station. The standard of these tests is a National one and should be uniform. Monitored by the DVLA. Our experience shows that most of the cars we appraise would fail our pre-M.O.T examination without any repair work or adjustment. It’s a fact that because of the testers unfamiliarity with older cars and inconsistencies when deciding on what is an acceptable amount of wear on an older car, no two testing stations we have encountered would give the same test result on a single example of our type of car. Having prepared the cars ourselves to what we judge to be safe and useable standard, we carry out a function check and an appropriate service prior to delivery. We rely on our customers goodwill in accepting that these cars are not new, mearly pre-loved & we are not trying to renovate them to be comparable with modern cars. This is an enthusiast based business and many of our customers are enthusiasts & home restorers. Most accept that they are getting a better deal with more security than buying from a private seller but the cars are old & simply can’t be expected to provide a modern cars level of comfort & fault free reliability. We hope the new owner accept that he is mearly the current custodian of these fine cars & we trust you will treat them with the respect its age deserves . The vehicles listed are described to the best of our ability. The information is based on our own research and statements made to us by the previous owner(s). To the best of our knowledge, the information is accurate. We are not responsible for errors in our description of options or any other details. The vehicles offered are used and can be expected to show some wear and tear. It is not a brand new vehicle. Border Reivers welcome and encourage, all independent pre-purchase inspections on our vehicles in order to verify condition. These must be carried out at our premises (we have full workshop facilities inc car lifts). Any files or paperwork relating to the vehicles will also be made available. With over 100 years of combined experience in our industry, the directors of A1 Approved have developed what we believe to be an unrivalled level of dealer and customer support to help promote and serve your business. A1 Approved offer a full range of warranty products to the motor trade to enable dealerships to market their vehicles more effectively and to assist in developing customer loyalty. A1 Approved’s on-line computer system is the most advanced in the business and is continually developed to meet our customer’s needs. We have kept the on-line process simple but effective and can tailor your account to suit your business needs. We at A1 Approved are the only warranty company that can handle, authorise and pay for a claim on the same day using our unique Claims Department fast-track system. A1 Approved is the only warranty company to offer one free phone number 0800 970 6860 for all enquiries – including claims. Legal Disclaimer : Border Reivers (classic cars) Ltd makes every effort to ensure that the Information contained in their adverts are accurate and complete. However, errors and omissions may occur from time to time and we are not able to guarantee the accuracy of the information. Therefore, we cannot be held liable for any reliance which you place on the Information, please also consider all recorded mileage as incorrect unless proven otherwise. Any motor vehicle is sold as a collector’s item and not as a means of transport. Buyers are specifically warned that any vehicles sold as such may well have had parts replaced and paint renewed or be made up of parts from other vehicles the condition of which may be difficult to establish & in some cases they may have been converted from left hand drive to right hand drive or vice versa. 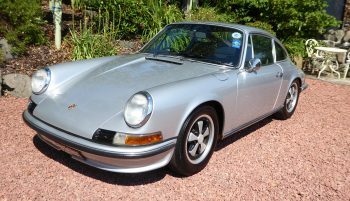 Border Reivers (Classic cars) Ltd has to rely on information as to the date,condition and authenticity provided by the seller. It is the responsibility of the buyer to ensure that the vehicle conforms to our description and to carry out their own due diligence of the condition before purchasing the vehicle. The vehicle can be inspected by the buyer or any agent the buyer appoints at our workshop. Border Reivers cannot check or verify the authenticity of the chassis or VIN numbers under which a vehicle is offered, We rely on the sellers description. 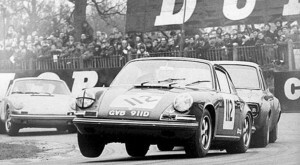 Buyers should take particular care to verify the authenticity of a vehicle that is claimed to have important racing, rallying or ‘ex-works’ history as it was common in period for a competition vehicle of a single identity to have more than one chassis, body or other mechanical components. This may have happened several times, both in a vehicle’s ‘works’ career and thereafter in private owners hands. 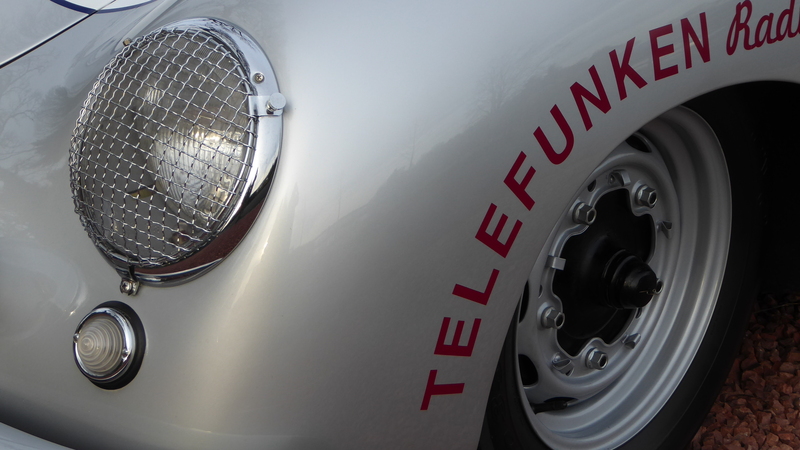 Sometimes ‘works’ vehicles were fitted with different registration plates, so that a vehicle could meet particular event’s start date deadline. These historical factors may lead to there being in existence multiple and competing claimants to the same vehicle identity.